Everybody says, "I" -- "I want this, I am like that..." But nobody understands this "I." Before you were born, where did your I come from? When you die, where will your I go? If you sincerely ask, "what am I?" sooner or later you will run into a wall where all thinking is cut off. We call this "don't know." Zen is keeping this "don't know" mind always and everywhere. being silent, moving, being still. without interruption -- what is this? One mind is infinite kalpas. 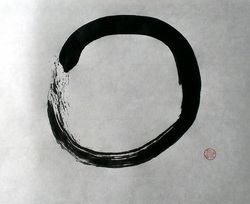 Meditation in Zen means keeping don't-know mind when bowing, chanting and sitting Zen. This is formal Zen practice. And when doing something, just do it. When driving, just drive; when eating, just eat; when working, just work. Finally, your don't-know mind will become clear. Then you can see the sky, only blue. You can see the tree, only green. Your mind is like a clear mirror. Red comes, the mirror is red; white comes the mirror is white. A hungry person comes, you can give him food; a thirsty person comes, you can give her something to drink. There is no desire for myself, only for all beings. That mind is already enlightenment, what we call Great Love, Great Compassion, the Great Bodhisattva Way. It's very simple, not difficult! So Buddha said that all beings have Buddha-nature (enlightenment nature). But Zen Master Joju said that a dog has no Buddha-nature. Which one is right? Which one is wrong? If you find that, you find the true way.